Hi, I'm Judith Greenburg! 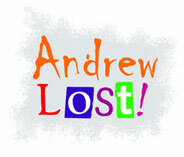 I write Andrew Lost! This is me and my family. 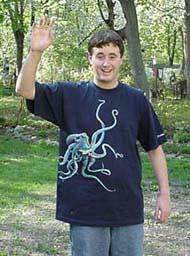 On the right is my husband, Dan. He's a writer, too. Maybe you've read some of his books, like "The Zack Files" and "Maximum Boy." That's our son, Zack, in the middle. He's such a great boy - and he's a terrific writer! That's me on the left. Want to know the tiger's name? Touch the picture with your cursor! We love to go on adventure vacations. 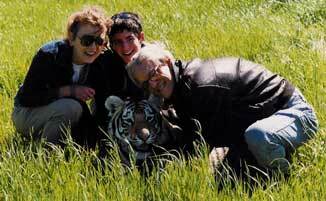 We met Tess when we visited a nature center in Texas to learn about Tigers. 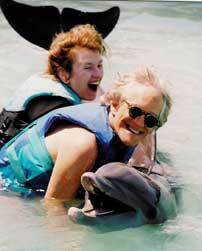 We've been to Hawaii to learn how to communicate with dolphins. And while we were in Hawaii, we flew in a helicopter over a fiery volcano and walked over lava beds. In Florida we swam with dolphins and took an airboat trip through the Everglades to get close to alligators! We also love to stay at home and write. 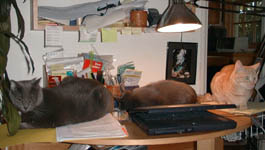 But sometimes that's hard to do - when you've got four cats that want to be on your desk. Three of them are on my desk now! The Andrew Lost series is named after my nephew, Andrew. His last name is Clancy and he's not exactly like Andrew Dubble, but he is an amazing boy. Ever since he was very small, he's been interested in all kinds of things, especially plants and astronomy. Andrew and Zack are both 17 now, and they're best friends.